We each need to find our own inspiration. Sometimes it's not easy. Why Does Spirited Away Endure? There is something truly special about the film Spirited Away, which was released in 2001. Like other films from the legendary Miyazaki, it endures well over a decade after the initial release. What is it about the movie that makes it a favorite of fans and critics alike? It is actually a combination of different things all working in concert. First, there is the story, of course. Then, you have to consider the beauty of the animation and the world that Miyazaki created. He actually came out of retirement to write and direct this film. He says that he based the story on a friend and the friend’s daughter. This is what keeps people in love with the movie, and it is what draws in new viewers all the time. In Spirited Away, a young girl named Chihiro is moving to a small town with her family. While they are on the way, they take a wrong turn. Her parents stop the car and decide that they will get out and explore the area. They find what looks to be an abandoned amusement park. Our heroine wanders around the park and meets a boy named Haku who tells her that she and her parents are in danger. When she returns to her parents, they’ve been turned into pigs, and now she must find a way to restore them. As with all of the films that come from Miyazaki’s Ghibli studio, the animation and the direction is always stunning. Keep in mind that during the time they were making Spirited Away, much of the world started to shun traditional animation techniques and were using computer graphics exclusively. It is a hand-drawn film, and that has been a very rare commodity as of late. Many studios, particularly those in the West, but some Japanese studios as well, were heading toward CGI almost exclusively. After Disney had several flops with their hand-drawn films, they figured that the traditional method of making movies was dead and they began using CGI. Miyazaki understood something that many in Hollywood and other studios did not at the time. It wasn’t just the style of the animation that mattered; it was also the story that counted. Children love story, just as adults do. When you have a great and interesting story that’s different from everything else that’s out there, as you do with Spirited Away, you will have a great film and the moviegoers will have a great experience. It is different from many films out there, but it has a classical story structure that will always work well. When most people think about movies from Miyazaki and Studio Ghibli, they think about the stories, along with the wonderful hand-drawn animation and direction. They remember watching films such as Nausicaa of the Valley of the Wind, My Neighbor Totoro, Princess Mononoke, and Spirited Away. However, the music behind the movie is just as important. Many would argue that without the wonderful music, the movies would not be quite as interesting and powerful. That’s actually true of most films. Stop for a moment and think about just how differen the experience would be without all of that great music. Often, it would remove some of the heart and humor from the experience. Studio Ghibli puts just as much creative power and thought into their music and themes as they do their storytelling, and the movies they’ve created over the decades have some of the best music in all of animation, and cinema for that matter. Honestly, this is just a fun song. It sounds very much like the start of a Saturday morning cartoon, and both the Japanese and the English version are equally great. Once you hear it, this song will be stuck in your head for days, and that’s not a bad thing at all… unless you start getting some strange looks while you are singing it in the grocery store! This music has an undeniably epic feel to it, and you can’t help but feel your heart and your spirits swell when you hear it. Once this is in your head, you will want to get out there and go on your own adventures, surely. While the other two pieces we’ve chosen as the best, or at least some of our favorites, are happy and upbeat, there’s something truly haunting about this music. The piano in particular is quite beautiful and sad, but the melodies will surely stick with you. Of course, coming up with a list of the best music from these movies is difficult, not to mention highly subjective. Everyone will have his or her favorite music, but we’ve done our best to come up with some of the ones that we feel are at the top of most people’s list. If you haven’t heard any of this music yet, you don’t know what you are missing. Watch the films, check out YouTube videos of the music, and pick it up if you can. You are going to love it. The 1988 anime film from Studio Ghibli was written and directed by Isao Takahata. This is an adaptation of a book from Akiyuki Nosaka, and is semi-autobiographical, and it happens to be one of the most powerful movies you will ever see. This is not lighthearted fare, as it is about the life of two orphaned children at the end of World War II. Westerners do not know what this period of life was like for those who lived in Japan, and this poignant and tragic story does a fantastic job of illustrating that. Roger Ebert said that Grave of the Fireflies was one of the best and most powerful antiwar movies made, and some have even compared it with Schindler’s List. The children in the film have lost their parents in the war. Their father was in the Imperial Navy, and their mother died in the firebombing in Kobe. The beginning of the movie actually starts with the death of one of the main characters. Much of the film is told through flashbacks, but it is never difficult to tell what’s happening. The children are left to survive on their own. Even their extended family seems to want nothing to do with them. The aunt they try to live with is exceedingly cruel, and even sells their dead mother’s things to buy rice for herself. The two decide to head out and live in an abandoned bomb shelter. Things are no better for them there. It does a fantastic job of showing just how rough it was for many people, the children especially, in the aftermath of WWII. As with all of the movies that come from Studio Ghibli, you will marvel at the quality of the hand-drawn animation. It is beautiful, and the artists truly managed to capture the horrors that these poor children had to endure. Without spoiling too much, when people say that this is one of the saddest films they’ve ever seen, they are not exaggerating. It is sometimes painful and heartbreaking to watch, but it is one of those films that you must see. It also happens to be a great movie to show the uninformed people who think that anime is all about fantasy creatures and robots. This is powerful, moving, and will leave anyone with a heart with some tears. Seek this film out if you haven’t seen it. Hayao Miyazaki is most notable for his many contributions to the world of anime, including such classics as Spirited Away and My Neighbor Totoro. However, he had a childhood dream of becoming a manga artist, and that dream never left him. In fact, he’s been working in that medium for as long as he’s been writing and directing films. His biggest work in manga is actually Nausicaa of the Valley of the Wind, which he started in 1981. It became extremely popular and has sold millions of copies around the world. It was just four years later that he would turn this into the much beloved anime film that we know today. While we’ll discuss the basic plot of the film, we never want to give away too much. Even older films have those who are watching them for the first time, and there shouldn’t be a time limit on spoilers, particular for a film that’s so worth watching. Still, you need a basic overview of the plot to know whether it might be something you would like to watch. This is a post apocalyptic fantasy that follows the titular character, the Valley of the Wind’s Princess Nausicaa, as she tries to stop another kingdom from destroying a jungle and the creatures that call it home. She’s attempting to find a cure for the Toxic Jungle and those that live within it. One of the things to note about this film is that there is a US version, which is actually quite a bit different from the original Japanese version. The US edit makes the movie far more kid friendly, but it destroys the impact of the actual film. It’s a far better idea to go with the original Japanese version, especially if this happens to be the first time you are watching the film. If you haven’t seen it already, then you really do need to watch Nausicaa of the Valley of the Wind. This is true whether you simply want to watch all of the films from Miyazaki, or you are simply checking his work out for the first time. It is truly one of the classics, and like all of the work that comes from Studio Ghibli, it is beautiful. There’s something truly special about hand-drawn animation that so many of the CGI iterations today lack. It also has a clear message about finding ways to work together, with tones of environmentalism thrown in for good measure. 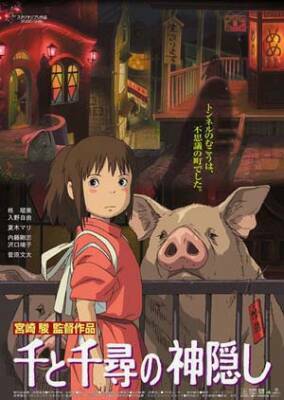 Released in 2004, this film written and directed by the incomparable Hayao Miyazaki, is actually based on a novel from a British writer names Dianna Wynne Jones. As with so many films from Studio Ghibli, this film went on to critical success as well as financial success. It made $190 million in Japan and $235 million worldwide. There is a US dubbed version that is available as well, but most purists will want it in the original Japanese with subtitles. Still, the casting for the US version is quite good with the likes of Christian Bale, Blythe Danner, and Billy Crystal taking roles. Why Is Howl’s Moving Castle Worth Watching? The best films, whether they are live action or animated, are able to provide an interesting story with interesting character while also providing thought provoking subtext. Now, anyone who is familiar with Miyazaki knows that he’s one of the masters of blending these elements together to create memorable films. In this case, he’s starting out with some great material thanks to the novel. Sophie is an 18-year-old woman who becomes the victim of a curse from a witch she refused service to at the shop where she works. The curse turns her into a 90-year-old woman. She then sets out into the Wastes in order to find a cure for the curse. She finds a castle belonging to a wizard named Howl, and also meets the fire demon responsible for powering this magical castle. The demon promises to break the curse, but only if she is able to break his contract with the wizard. The demon doesn’t want to continue powering the castle under the order of Howl. As with all of Miyazaki’s films, there is quite a bit more going on than just this plotline. There is also a war brewing between the nation where Sophie lives and the neighboring kingdom. The story has action, adventure, romance, and more, making it very worthy of multiple viewings. There are a number of interesting twists and turns, and if it is the first time you’ve seen the movie, it will take you into some directions you do not expect. Of course, another one of the things that helps to make this a great film is the animation. Through the years, Studio Ghibli has always been able to create some of the best looking and interesting anime films. It also happens to have a happy ending, which is not always a given with Miyazaki’s films.